Home > Best Practice Journal > 2011 > BPJ: 37 > Rheumatic fever in Māori: what can we do better? This item is 7 years and 8 months old; some content may no longer be current. Rheumatic fever in Māori: what can we do better? In New Zealand, acute rheumatic fever is now almost exclusively a disease affecting Māori and Pacific peoples. The majority of cases are occurring in low socioeconomic communities in the northern and central North Island and in pockets around the Wellington region. Primary care clinicians need to know the risk of rheumatic fever in their community and to encourage at-risk people to seek a consultation when they have a sore throat. In high-risk areas, all Māori and Pacific children who present with a sore throat should have a throat swab taken and antibiotics prescribed empirically if any red flags are present. The rate of Acute Rheumatic Fever (ARF) in New Zealand is increasing. 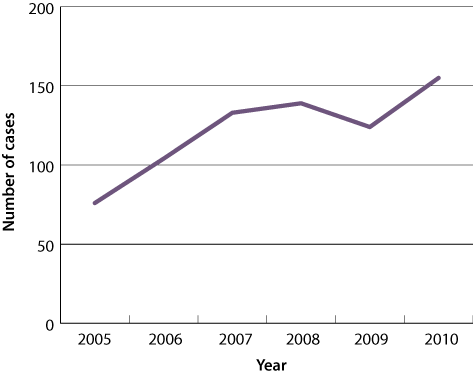 Between 2005 and 2010, the rate of ARF doubled from 1.9 reported cases per 100 000 population to 3.8 per 100 000 (Figure 1).1 The majority of cases are occurring in low socioeconomic communities in the northern and central North Island and in pockets around the Wellington region. ARF is 23 times more likely in Māori and nearly 50 times more likely in Pacific peoples than in other ethnic groups.2 From 1996 to 2005, while ARF rates significantly decreased amongst New Zealand Europeans, rates amongst Māori and Pacific children increased significantly. Although comprising just 4.7% of the New Zealand population, this group represented almost 60% of all cases reported.3 It is widely believed that this over representation is due to a combination of overcrowded living conditions, poverty and decreased access to treatment options. In New Zealand, ARF has been a notifiable disease since 1986. Despite this, it is likely that there are significantly more cases of ARF in New Zealand than are currently being reported to health services. A 2008 review of ARF cases (1999–2007) in the Bay of Plenty and Lakes Districts DHBs found 147 cases, where only 75 had been previously reported.5 Factors identified as contributing to under reporting by health professionals included; difficulty of ARF diagnosis, multiple health professionals being involved at multiple institutions and health professionals being unfamiliar with reporting requirements due to a lack of experience with ARF or as a result of being trained overseas. It is also likely that some patients will not present unless the symptoms are severe. People who have RHD have a higher risk of developing infective endocarditis and need to maintain good oral hygiene and attend regular dental check-ups. Dentists and other health professionals need to know if a patient has RHD, as it increases the risk of infection. Patients who have been identified as being at risk are given wallet cards (see Appendix H of Heart Foundation guidelines4) to present to health professionals. These cards contain recommended doses of additional antibiotics that may be required for various procedures, e.g. dental procedures involving bleeding of gingival tissues. Rates of ARF vary throughout New Zealand. It is important that primary care clinicians know the approximate rate of ARF in their communities (Figure 2). Practices in northern and central North Island and Porirua should be on high-alert for ARF and the group A streptococcus (GAS) throat infections that cause it. Māori and Pacific peoples have higher rates of GAS infections than New Zealand Europeans.6 However, awareness at a national level is required given the high degree of mobility amongst the young adult population. Overcrowding, economic deprivation and decreased treatment opportunities also increase the risk of a person developing ARF.7 When a patient presents with a sore throat, assessing these factors during consultation indicates the risk that person may have of developing ARF. Treatment of GAS sore throats with penicillin V (phenoxymethylpenicillin) or amoxicillin is considered the first-line treatment for preventing ARF.13 Note that this is an update to the National Heart Foundation sore throat guidelines, which recommend penicillin V as first-line treatment and amoxicillin as second-line.14 Amoxicillin is more palatable and may be taken with food, which may encourage increased compliance with treatment, compared to pencillin V.
The following information has been updated, please see http://www.ttophs.govt.nz/vdb/document/1056 for the latest information. Some General Practitioners may be reluctant to prescribe antibiotics empirically due to messages about the “Wise Use of Antibiotics”, which have reduced antibiotic use and patient’s expectations for receiving them for colds and sore throats during winter months. It is important that practices understand that wise use means carefully selecting patients who might benefit from antibiotics, rather than avoiding prescribing completely. In most cases, ARF can be prevented if antibiotics are taken within nine days of onset of symptoms. Culture of a throat swab is the best way to confirm a GAS infection. Running a standard, sterile microbiological swab over the tonsils, back of the throat and any area with exudate, while avoiding the tongue and teeth, ensures a good sample is collected. When possible the sample should be sent for culture within two hours, however a delay of up to twenty four hours is acceptable. In high-risk areas, all Māori and Pacific people aged between three and 45 years, who present with a sore throat, should have a throat swab taken. Prescribe antibiotics empirically if a sore throat and any red flags are present. If patients later return a positive GAS culture, then prescribe antibiotics if they are not already taking them. Swabbing and treatment of entire households should occur if more than three cases of GAS sore throat occur in the same home within a three month period. The New Zealand algorithm for sore throat management also provides guidance for managing households and whānau in high-risk areas. A New Zealand algorithm for the management of sore throats is available from the Heart Foundation website (listed at end of article). Best Practice tip: To find out the incidence of ARF in a specific area, contact the Medical Officer of Health at your local Public Health Unit. There is currently no diagnostic test for ARF so clinical judgement is important. New Zealand guidelines for the diagnosis of ARF are based on the Jones criteria and are available from the Heart Foundation website (listed at end of article). The presence of two major symptoms, or one major and two minor symptoms, in both cases with a prior GAS infection, are required to diagnose ARF. Carditis almost always affects the mitral and aortic valves and on presentation, a murmur may be heard.6 In New Zealand, subclinical carditis confirmed by echocardiography is also considered a major symptom. Chorea (uncoordinated movements), often in adolescent females, especially affecting the hands, feet, tongue and face which disappear during sleep and may only affect one side of the body. Chorea may occur following a prolonged latency after streptococcus infection and generally resolves within six weeks. Antistreptolysin O titre is used to confirm the diagnosis, as less than 10% of people with ARF have GAS positive throat swabs. Assuming no re-infection, antibody levels return to normal in six to 12 months. All patients with suspected ARF should be referred to hospital for confirmation of the diagnosis. Hospitalisation also provides an opportunity to educate whānau about the condition and the importance of preventing recurrent attacks. Rheumatic fever registers are an important tool for managing patient compliance to secondary prophylaxis, particularly when people move. Registers are also necessary for analysing epidemiology and channelling financial resources into regions with the greatest need. The Auckland rheumatic fever register was established in 1981 to streamline antibiotic delivery to patients. The subsequent clinic-based prophylaxis programme saw recurrent rheumatic fever attacks fall from 20% of total hospital admissions for rheumatic fever to 6%.18 Further, widespread reductions would be likely if a national rheumatic fever register was established. Māori and Pacific people have the highest recurrence rates of rheumatic fever. In Auckland, between the 1980s and 1999, recurrence rates dropped from 22% to 5.5%, but in 1999, all reported recurrent cases of rheumatic fever occurred in Māori or Pacific peoples.16 In 2008, 10% of all cases of ARF in the Bay of Plenty and Lakes District DHBs were recurrences. Patients receiving prophylactic treatment should only stop receiving BPG injections following specialist consultation. On 26 April 2011, a group of 40 health professionals from areas of high prevalence for rheumatic fever met to discuss a pathway to achieve eradication of the disease. The National Steering Group and the Ministry of Health are now working closely to achieve this goal. Presentations from Professor Diana Lennon, Dr Pat Tuohy and representatives from high risk areas outlined the cross-sectoral approach to managing rheumatic fever, including what has worked and what has not. Workshop groups then discussed health promotion, the role of primary care, monitoring progress and integration with other childhood illness. An over-arching theme was the need to bring all initiatives and knowledge together to ensure cohesion, quality processes and success. Nurse management of sore throat is an effective means of assuring accessible and affordable care in high risk areas. Flaxmere, Kaikohe and Porirua provide current best practice examples. A “walk in” basis is important with no financial barriers, with training supported by PHOs as part of existing continuing medical education (CME). Ensure parents know that prescriptions for children aged under six years are free of charge (or for those with a prescription subsidy card, Community Services card or High User Health card). Increase awareness of the importance of completing the ten day antibiotic course. Amoxicillin once daily is a good option for increasing compliance (compared to penicillin V which needs to be given two to three times daily on an empty stomach). For standardised care, IT support should be available in all practices with prompts for sore throat management. Local adaptation and simplification of guidelines in high risk areas such as Porirua can work well. Contributed by Professor Norman Sharpe, Medical Director of the National Heart Foundation of New Zealand and acting Chair of the National Steering Group. Following the seminar, the current management algorithms from the Heart Foundation guidelines are being reviewed and an agreed evidence-based approach to school and community clinics developed. The recent budget allocation of $12 million to assist eradication highlights the importance of rheumatic fever as a now recognised marker of child health. Minister Tariana Turia’s championing and support for this successful bid and for raising the profile of rheumatic fever should be acknowledged. The current convergence of interest around this challenging issue allows guarded optimism that eradication can indeed be achieved. A follow-up seminar is planned for the end of the year. In recent years, there have been several school-based initiatives in New Zealand. In the Northland community of Kaeo, Whangaroa, pre-intervention rates of ARF in children aged five to 14 years were 424 per 100 000. In the eight years following the intervention programme, which started in 2002, there have been no reported cases of ARF. For further information see: “Why we still need to think of rheumatic fever”, BPJ 13 (May, 2008). The success of the Whangaroa programme has resulted in the launch of other school-based programmes. In October 2009 a similar project was launched in Opotiki. For several weeks in October 2009, when the programme started, 20% of all children with sore throats tested positive for GAS. By December 2009 the rate had dropped to 11% and further decreased to 3% by December 2010. Identical programmes have been launched in Kawarau (February 2011) and Murupara (May 2011). “A major reason why some communities have high rates of ARF is that the chain of events from sore throat to antibiotic administration is much too long. The chain can be broken at any point, resulting in the child missing treatment. Our solution is to do ‘near patient testing’ in the community and to make swabbing a simple and easy choice. The old saying – make the decision the easiest and simplest thing to do!" Community programmes are not just about swabbing children’s throats. Increasing community understanding of the link between GAS sore throats and ARF is also a key component of their success. In Bay of Plenty, a multi-media campaign was launched with locally-affected children fronting local campaigns. Press releases, advertorials and commissioned articles appeared in newspapers, radio adverts were aired on eight stations, newsletters distributed at schools and a rheumatic fever website created. Rheumatic fever presentations for local GPs were also conducted at CME sessions. In larger metropolitan areas, or in sparsely populated regions where school-based projects are impractical, this raising of specific community awareness assumes even greater significance. In the 2011 Budget the Government announced an additional $12 million in funding allocated to combating ARF. It is anticipated that more school-based programmes and supporting multi-media campaigns will be created. GPs in high to medium risk areas may be asked to support such programmes as this increased funding becomes available. Examples of the media campaigns can be seen at: www.toiteorapublichealth.govt.nz/sitesearch/?k=rheumatic+fever. Did you know there is an audit related to this topic? See "Sore throat management of at-risk people", bpacnz (2013). Thank you to Professor Norman Sharpe, Director, National Heart Foundation and Dr Jim Miller, Medical Officer of Health and Lindsay Lowe, Communicable Disease Nurse, Toi Te Ora Public Health Service, Bay of Plenty DHB for expert guidance in developing this article. Public Health Surveillance. Annual Surveillance Summary. Ministry of Health, 2011. Available from: www.surv.esr.cri.nz/surveillance/annual_surveillance.php (Accessed Jul, 2011). Hale M, Sharpe N. Persistent rheumatic fever in New Zealand - a shameful indicator of child health. N Z Med J 2011;124(1329):6-8. Jaine R, Baker M, Venugopal K. Epidemiology of acute rheumatic fever in New Zealand 1995-2005. J Paediatric Child Health 2008;44:564-71. The National Heart Foundation of New Zealand. New Zealand guidelines for rheumatic fever: 1 Diagnosis, management and secondary prevention. Heart Foundation, 2006. Available from: www.heartfoundation.org.nz (Accessed Jul, 2011). Kerdemelidis M, Lennon D, Arroll B, Peat B. Guidelines for sore throat management in New Zealand. N Z Med J 2009;122(1301):10-8. Yang LPH, Eriksson BKG, Harrington Z, et al. Variations in the protective immune response against streptococcal superantigens in populations of different ethnicity. Med Microbiol Immunol 2006;195:37-43. McNicholas A, Lennon D, Crampton P, Howden-Chapman P. Overcrowding and infectious diseases - when will we learn the lessons of our past? N Z Med J 2000;113:453-4. Howie JG, Foggo BA. Antibiotics, sore throats and rheumatic fever. J R Coll Gen Pract 1985;35(274):223-4. Carapetis JR, Currie BJ, Mathews JD. Cumulative incidence of rheumatic fever in an endemic region: a guide to the susceptibility of a population. Epidemiol Infect 2000;124:239-44. 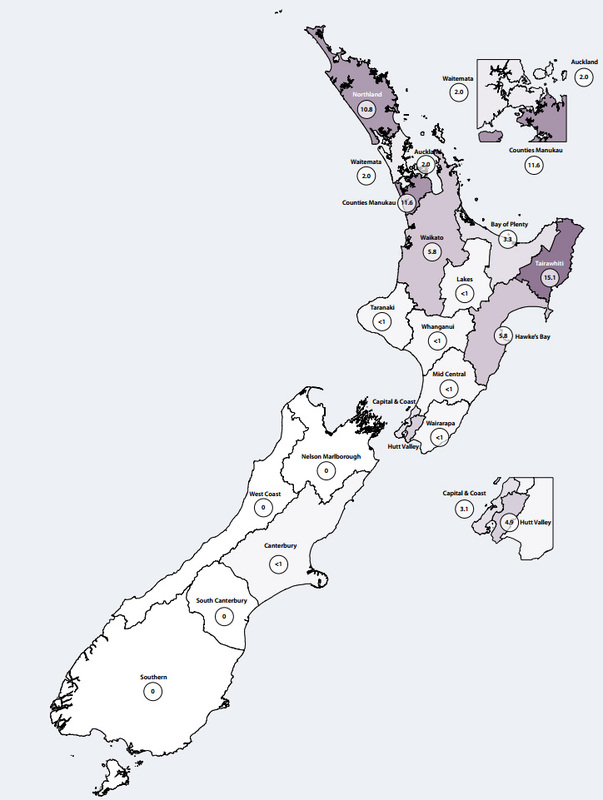 Loring B. Rheumatic fever in the Bay of Plenty and Lakes District Health Boards: A review of the evidence and recommendations for action. 2008. Available from: www.toiteorapublichealth.govt.nz/Rheumatic_Fever_GP (Accessed Jul, 2011). Robson B, Hauroa RH. Māori standards of health IV. A study of the years 2000-2005. Ministry of Health,Wellington; 2007. The National Heart Foundation of New Zealand. Guidelines for rheumatic fever: proposed rheumatic fever primary prevention programme. 2009. Available from: www.heartfoundation.org.nz (accessed May, 2011). Lennon D, Kerdemelidis M, Arroll B, Sharpe N. Once-daily amoxicillin for Group A Streptococcal (GAS) sore throat as the other first-line option: a clarification of the NZ sore throat guidelines. N Z Med J 2011;124(1338). The National Heart Foundation of New Zealand. Algorithm 4: Guide for sore throat management, 2009. Available from: www.heartfoundation.org.nz (Accessed Jul, 2011). White H, Walsh W, Brown A, et al. Rheumatic heart disease in indigenous populations. Heart Lung Circ 2010;19:273-81. Atatoa-Carr P, Lennon D, Wilson N. Rheumatic fever diagnosis, management and secondary prevention. N Z Med J 2008;121(1271):59-69. Spinetto H, Lennon D, Horsburgh M. Rheumatic fever recurrence prevention: A nurse-led programme of 28 penicillin in an area of high endemnicity. J Paediatric Child Health 2011;47(4):228-34. Grayson S, Horsburgh M, Lennon D. An Auckland regional audit of the nurse-led rheumatic fever secondary prophylaxis programme. N Z Med J 2006;119(1243):U2255. Lennon D, Kerdemelidis M, Arroll B. Meta-analysis of trials of streptococcal throat treatment programmes to prevent rheumatic fever. Pediatr Infect Dis 2009;28(7):e259-64. Scandinavian Evaluation of Laboratory Equipment for Primary Health Care. Dtec Streptococcus A test card - Strep A test evaluation in a hospital laboratory as commissioned by Dtec AS, Norway, 2004. Available from: www.skup.nu/GetFile.ashx?fileid=325 (Accessed Jul, 2011). Shiromani Goyal said: 1/12/2014 4:45:20 p.m.
Overcrowding and damp conditions of living increase the incidence of rheumatic fever. In New Zealand the winters are wet and most of the houses are damp. Overcrowding is related to low socio economic state of the Maori and Pascific communities and every effort should be made to alleviate it but an easier and more fixable way of dealing with the issue is to make the homes drier so that the susceptibility to the infection decreases. This article is 7 years and 8 months old. Whānau Ora: the theory and the practice Rheumatic fever in Māori: what can we do better? The medical management of gout revisited Cardiovascular disease risk assessment: what are the PHO Performance Programme indicators and how are they best achieved? Building cultural competence: the Medical Council's direction Gout: an alarm bell for diabetes and cardiovascular disease Raynaud's phenomenon: a whiter shade to winter's pale Upfront: Meeting the needs of children and young people in New Zealand who have been abused and neglected News in brief: Varenicline: amendments to Special Authority funding Correspondence: Oxycodone: is the problem in secondary care?